To start, my aquarium parameters are 0 nitrate, and 0 nitrite (I'm not sure about ammonia, since I've been dosing with prime I know that can change results/ give false positives) I detected a presence of ammonia a week ago (0.25 ppm) , which alerted me that my cycle had crashed. For reference, this is a 55 gallon I just set up a few weeks ago with four goldfish; however, both canister filters were moved from previous aquariums the fish lived in (which led me to incorrectly believe my cycle would be fine in the upgraded aquarium). Since detecting the ammonia I'm now doing 45% water changes every two days (before that I was doing water changes biweekly). My Pearlscale has what I assume are ammonia burns (red areas, which later started to turn black); however, in the last two days she has lost two scales and the red areas are spreading. (Pics included show both sides of her) I am the most concerned about her scales beginning to pinecone out (she's had it for a little longer than a week), obviously my main concern at this point is dropsy. She isn't floating or having any trouble swimming, her gills are red, and I haven't detected any 'air bubbles' underneath her scales. She's eating fine, but I'm not sure that she's pooping as much as she should (she normally has long, dark poops, but hasn't recently). I was going to leave her in the main tank and continue to do water changes; but would it be better to set up a ten gallon quarantine tank for her? If so, would you recommend that I begin treating her with antibiotics? Or should I do salt baths? I fed her peas, and she did end up pooping (normally I feed Repashy Soilent green fish food daily or every other day, and then feed peas once a week) her behavior is still fairly normal, she swims around the tank and isn't sitting with her fins clamped. 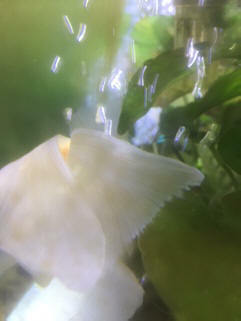 My next concern is my largest Oranda has developed fin rot, I have included two pictures I took yesterday; what concerns me most is that her tail has gotten even worse since I took these pictures (I'll try to get more pictures later today), as there are now red sections along the edge of her fin. Is it safe to treat the entire tank for fin rot while it's still cycling? I would like to treat the entire tank in this case because my other Oranda and black moor have tears in their fins and white spots along the edges. What's especially bizarre is I noticed a white fuzz on one of the Anubias nana plants I have in the aquarium (once again I'll try to get a picture later today); it's coming from the stalk and from some of the ends of the roots, it looks like some sort of fungus. Should I remove the plant from the aquarium or is it safe to keep it in? Any advice you could provide would be greatly appreciated! If I were to treat with salt, would you recommend doing a salt dip or to treat the entire aquarium? I'm cleaning her tank everyday with 70% water changes, and she has an air pump and sponge filter set up with her. She isn't bottom sitting or hiding in this tank, and she eats (I'm only feeding her a few peas every couple of days now). She is a very social, good natured little fish (which hasn't changed since she became sick). At this point should I be concerned about septicemia? Or would you say the red is ammonia burns/poisoning? Another note, one of her scales fell off but is still attached to her (just by a little bit), it's become 'fuzzy' looking, I figured I would leave it be and let it fall off on its own, but would it be better to cut it off? The other fish (in the main tank) are doing better, the fin rot on my larger Oranda looks about the same (barring a few tiny red patches that I couldn't quite photograph). I've been putting Tetra Safe Start in the tank (definitely not my first choice, but the only thing locally available), so far ammonia levels seem lower than they were originally, but I haven't detected any nitrite or nitrate. I will continue doing small water changes with the hope that it will cycle. Thanks for responding & since you did I have a ?. If I feed mostly veg as suggested will my fancy gold fish be getting all those vitamins they need ? I will be feeding some brine shrimp along with peas lettuce chard zucchini water cress & seaweed. I have two goldfish a comet and a fantail, both purchased from the pet store, in a marina 30 or 60 litre aquarium which was set up in 2009. I have had the fantail for eight years and the comet for five. The tank has a proper filter system and only has two plants in it, so there is lots of room. It gets cleaned out once a week and one of the filter cartridges is taken out and replaced each month along with the filter sponge. their whole life and there use to be snails in the tank which we fed algae pellets but the fish use to eat them as well but this was a few years ago. they ate less and was making the tank dirty. 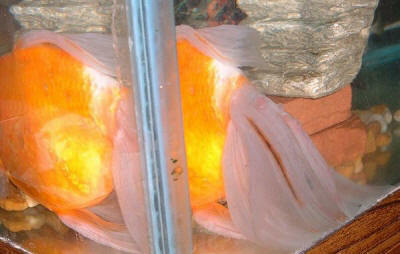 I have researched swim bladder and it says it doesn't cause the fish any suffering. However, over the past year he has developed a lump on the side, which I now believe might be what is causing his balancing problems however, I am unsure. I just don't want him to suffer and just wanted to hear your opinion of what it might be and how to help him in the kindest way. I will send a separate email with some pictures. <Ah yes; please see the linked files above in the link I sent you... for hundreds of examples of the same. Or my book on Amazon on Goldfish care. I've read lots of the info on dropsy and still need help. 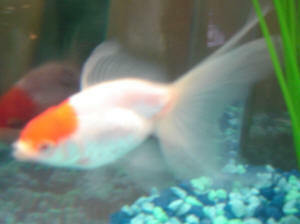 I'm including photo and video rejoice44@mac.com if will help our kind pet goldie "Its history is that of a feeder fish bought over 3 yrs ago for pond area testing. Only one of 3 that survived by putting its mouth to air bubble tube when it appeared dead! 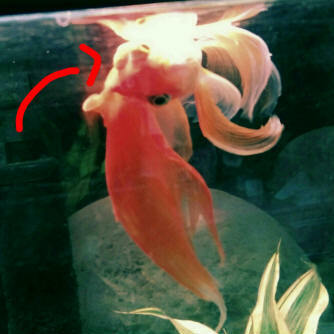 Was fine in 65 gal tank w/two fair-mates <Like this term!> (goldfish) for over 3 years. This past 3 mo noticed getting really big and thought she was just a good eater or pregnant. Water changes consistent q two weeks with 2 of those $50-70 Fluval filter pumps and good bio filtrations. Tank has always been stable in parameters. Last week looked like golfball in back of her left side. but weirdly in seemed mostly on her left side (even only the left eye) though whole body quite bloated left was worse. I QT'd 20 gal with 1 tsp Epsom salt per 5 gal., water temp increased slowly to 78 , + air bubbles, and non charcoal pump. Next day started Kanamycin dosing as per label q two days NTE 3 doses. She wont eat medicated food (tried MetroMeds powder mix to pellets per their instructions as no one carried metro med food. or other med food). Still quite bloated... poops some long stringy white (parasite)? some brown and long w/ string on end. Tried feeding peas. Appetite poor. Been cleaning tank small tube getting all junk out of bottom. Have done a couple water changes about 5 gal then adding back appropriate meds/Epsom. Tried increasing temp to 82 /84. Another thing went terribly wrong when I was suctioning I noticed her huge soft boggy side and had read that the pinecones were really blisters of pus and I touched her side with the tube looked like long strings coming out. I thought perhaps may help get the infection out but really I think it made it worse (see her side) as the scales popped off leaving a space between the outer scale layer and inside layer. Ugh it looks horrible. I think the right side is better after Kanamycin yet fish still really bloated. I don't really see much improvement. So after a pwc (25% we started Maracyn + (today was second dose of q other day). (have read 1/8 tsp to 1 tablesp. advice so perhaps under dosed). ...I read that 86 degrees has helped some with dropsy. Find a vet (perhaps she just needs fluid removed off that one side or Baytril injections)? On the positive side, she's never been ill and has been a great pet. She is swimming fairly well. Always comes to the corner when I enter the room. Its seems one side of her looks fine...et the other is pine-coned and now injured. Also I noticed some black marks around scales read this may be indicative of healing response. Also I noticed a bit of whitish very slight coat on head. PS We are changing all the big golds diet from pellets to alternate peas q day (read your dietary guidelines). Any help is greatly appreciated! And so sorry to bother you knowing how busy you are...I'm just so desperate to help her. My husband said to disregard the test results as the test kit is way beyond expiration. Also since the QT is newly made up with 1/2 new water and 1/2 old (but changed regularly water) it cannot be correct. Thanks so much Bob..The Spectrum line of pelleted foods is what we use also:) I doubt there's much else I can do now as today she is laying on her side and back and breathing funny. The bloat is still considerable and perhaps her body cant continue in this state. I know this and the others (fair mates) have had a bad start. All the more reason to be hyper vigilant on water quality. The tank has been no problem for over 3 years. With this fish I noticed she was getting bigger and growing more than the other two but then it seemed to suddenly bloat up over 24 hours. Curious...could a renal issue cause the ammonia to spike? She left us with about 10 fry that have made it to about 2 inches long. Guess we will call one little goldie". Sorry for the scattered email. And thanks for bearing with us...we are very informed now about this particular symptom and have learned a lot so I guess Ill try to focus on that and that she had a happy life. 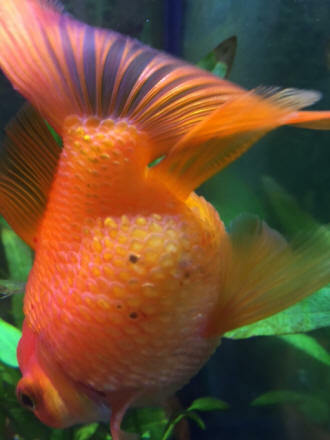 One of my goldfish, the little guy, is sick. He (of course I don't know if he's a he, but still...) has been tending to hang about on the bottom of the tank for a few weeks that I've noticed, but he swims almost constantly, like the others, and I have only today seen any further suggestions that there is a real problem. Today he has obvious "dropsy" with slight pineconing evident when viewed from above, and I think his eyes are also bulging a bit too much. This is a 1 inch "pet shop cheapy" fantail goldfish that I've had about 6 months now. 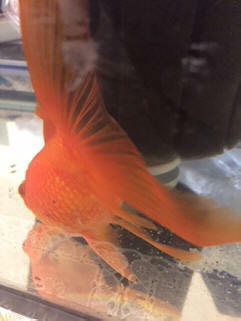 The other goldfish I bought at the same time, at the same size, is now 2-2.5 inches long, so I have been wondering for a long time if the little guy has some problem that is slowing his growth and causing illness or a vulnerability to illness. 220l "cool water community" tank with 3 fantail goldfish (1 inch, 2 inches and 4 inches), 5 Crossocheilus siamensis, a handful of wild-type guppies, 5 Corydoras trilineatus and a breeding population of cherry shrimp. Nobody is aggressive to anyone else, as far as I can tell. Tank is heavily planted, mostly with fast-growing stem plants, moderate lighting, filtered by a Fluval 305 and lit with T5 lights, has been running for over 2 years with few problems (but I have lost 3 other goldfish in that time, maybe some subtle systemic problem?). I feed the fish twice daily, a mixture of Hikari goldfish pellets (goldfish and Crossocheilus siamensis go for these) and sinking small community pellets (everyone else goes for those), or a pinch of spirulina-based flake. Some days I leave them without food, not often. Since I don't know what has caused this fish to be sick, I don't know what to do about it. Is it worth isolating it and treating with Epsom salt? Or with antibiotics (not much in the way of good medication is available here in Australia, unfortunately, I can get things like Methylene blue and tetracycline)? Do you have other suggestions other than waiting and seeing? Note the small "lesions" at the base of this animal's tail.